The last few months have been a lot of work. We signed a partnership, developed five new products, designed a stand and dedicated ourselves to the details so that our first participation in Maison & Objet, one of the biggest design and decoration fairs in the world, was a success. The fair took place in Paris between September 7th and 11th. Studio Deusdara and Levira, Portugal's traditional office furniture brand, have teamed up to develop a collection of sideboards, a cabinet and a stool/table. We´ll talk a little about some of them and also highlight what most caught our attention and what we bet as trends for design and decoration for 2019. Check below! The main entrace of our Hall 6. Eight pavilions that seemed to have no end, more than 3000 exhibitors from 72 different countries, and almost 120 thousand visits in the five days of fair. The September issue of Maison & Objet 2018 was spectacular and focused on the comfort of spaces. Therefore, we find many rounded pieces, fluid forms that invite the host. Following the theme of the comfortable environments, the tactile fabrics, with textures and attractive touch, also caught the attention. Our Manteigas Collection, with three dressers of varying sizes and colors, follow this trend. The furniture has the doors and the backs covered in Burel, a fabric made exclusively in Portugal, from sheep wool, which makes the aesthetics cozy for the office or home. If tactile fabrics are on the rise, velvet is their champion. Most of the sofas and armchairs were lined with this fabric and in strong colors, such as green, pink and burgundy red. You can bet without error! Queeboo and its velvet rabbits. It is a time of brilliance, but an elegant, iridescent glow or steal-color. It was also seen in furniture but the tendency appears with much more force in the accessories, like chandeliers, vases, bowls and articles of decoration. Strong allies of sustainability, the pieces that allow a customization, had a prominent place among the brands that participated in the Maison & Objet 2018. Our Bu Lamp, with the hood imitating a skirt, is fastened by buttons, which facilitate the exchange both to vary the décor and to clean the product. Bu Lamp in grey bell. Season comes, season goes, and Millennial Pink does not seem to get out of focus. 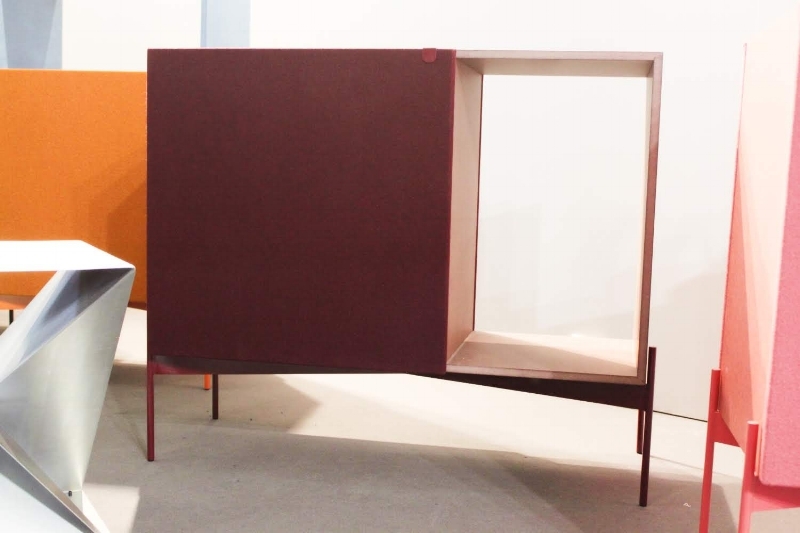 In this edition of Maison & Objet he began to divide the attention with mustard yellow and other colors of what they are calling a modernist palette, with burgundy and dark blue. However, the tone of dry rose remains firm as a favorite of designers and decorators. If you want a modern and trendy decoration, you can bet on products with a rustic touch, made of natural fibers such as rattan and wicker. They contribute a lot with the cozy atmosphere and comfortable surroundings of the house. Vincent Sheppard and its lights pendants. Whether in animal shapes or in plant prints, nature-inspired shapes have appeared in many objects of design and decoration. But not only in them! The plants invaded the surroundings and everywhere there was a green touch. We love it, so much so that we already made a post here on the blog just talking about them! Drugeot Labo: no animals were killed. A few booth in the green. Joining the Maison&Objet was quite an apprenticeship. We came back grateful for the opportunity and with a head full of ideas to put it into practice. Keep in mind that soon we will publish our impressions of Paris Design Week, which took place in parallel to the design and decoration fair.